The Single currency gains as the US Dollar weakens. Although Friday's Non-farm Payrolls printed better than expected, the greenback ended the day at a low as Fed's Powell hinted that the Federal Reserve might pause hiking rates for now. During his late Friday speech, Powell emphasized the flexibility and patience of the Fed amid negative signals from the stock market and rising concerns surrounding global growth. For today, investors will continue pricing in Powell's Friday comments. Additionally, investors are keeping a keen eye on any news coming out of the US/China trade meeting which begins today. 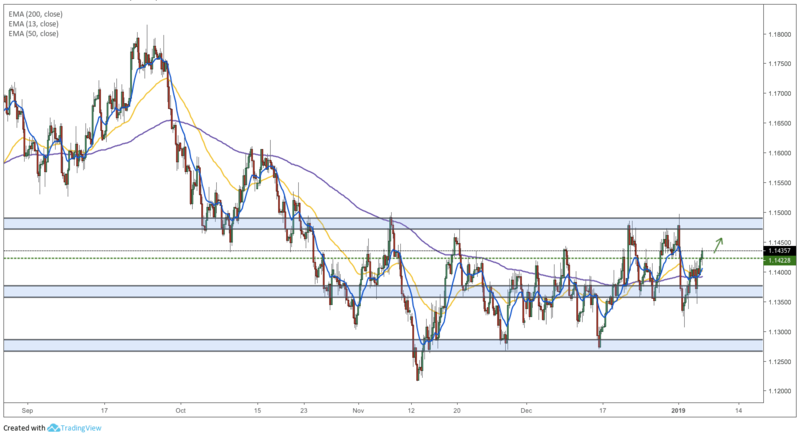 The Euro breaks above the 1.1422 resistance level paving the way for a rise towards 1.1470. The break of this level also coincides with a break above all the three major moving averages signaling strong bullish momentum. Adding to the bullish momentum, the 13-period moving average recently broke above the 50-period moving average.